1. A-line, floor-length fitted gown of an ivory duchess silk or silk-like satin (should be a soft sheen, not shiny) with a low scoop neckline and a long satin tabard shaped like a large tie painted lightly with one small and one large Naboo symbol in graduated shades of cream, light rose pink and light golden yellow, outline in medium gray. The gown also has knuckle-length fitted sleeves of an ivory sheer crinkled chiffon or gauze. 2. 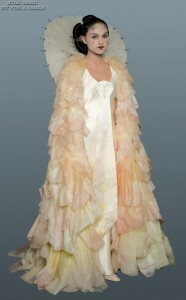 Full floor-length cloak with a modest train of an ivory silk or silk-like fabric covered thickly with large petals of sheer crinkled chiffon or gauze dyed with sheer touches of cream, light rose pink and pale golden yellow. The cloak is lined in an ivory matte fabric. 3. Large round whisk with spokes like an umbrella covered in two layers of a sheer ivory matte crinkled organza fabric, edged with silver abstract bird-like decorative spoke tips and is decorated with a sparkling silver trailing scroll vine pattern embroidered or finely painted along the spokes. The whisk is attached to the back of the cloak at the shoulder, and should be very firm, not limp. 4. Low-heeled embroidered tailored shoes or pumps in ivory. 5. Hair is pulled back into a ponytail with 5 sections folded into a circle of “bows”, secured with silver metallic bands. A net-like, triangular white rhinestone diadem is draped over the forehead secured to the hair by three delicate silver chains on either side. No bangs. Naturally-occurring hair colors only. 6. White make-up on the face, neck and hands (must not be splotchy or uneven). A red upper lip and a white lower lip with a red strip down the center, with a red dot on each cheek centered beneath each eye.